I made some wonderful grapefruit infused vodka and was enjoying my Pink Grapefruit Martinis several days in a row - until I ran out of fresh grapefruit juice! I did have some fresh lemons so I just substituted fresh squeezed lemon juice for the pink grapefruit juice, muddled in some fresh basil leaves and - bingo! 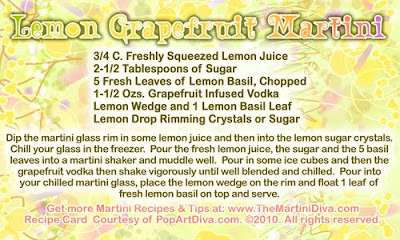 - another wonderful way to enjoy my grapefruit vodka. Until I ran out of that. Feel free to leave out the lemon basil leaves if you don't have any or try fresh mint instead!